So I guess you could say I've decided to try my hand at quilting. On a whim, I purchased these two mini-quilt wall hanging kits at The Cozy Quilt Shop in July, using my birthday discount. The patterns for both kits are from Cottage Creek Quilts' "Backdoor Quilt Series". They didn't seem to be too complicated for a beginner like me. Just before Labor Day this year, I couldn't resist the sale at the Viking Sewing Gallery for a Fab-U-Motion Fabric Mover. And after investing in this bit of hardware, I was anxious to get my feet wet and start experimenting right away. I ordered the Fabric Mover at the end of August, but I had to wait about a week for it to arrive, so I spent a few hours doing some prep work, tracing out appliqué shapes and fusing them with Steam-A-Seam Light to the base fabric. And yes, there was a small bit of piecing together of some border fabrics, too. Some of the fabrics in the kit were not exactly to my liking, but I decided these were learning pieces, so it didn't matter. I just needed the quilting practice right now. Within an hour of bringing home the Fabric Mover, I had it all plugged in and ready to go. I watched the instructional DVD with Sue Hausmann, set up my sewing machine with the included free motion foot and some thread and a practice piece of "quilting" - two layers of cotton fabric with some cotton batting in between. I played with the Fabric Mover for quite a while to get the feel of moving the table around and adjusting the thread tensions. When I thought I was ready, I moved on to free motion quilting the appliqué pieces on the "Be Thankful" quilt. The project instructions said to do free motion outline stitching around the appliqué pieces a few times, stitching through all layers so that the project would be appliquéd and quilted at the same time. Fun and fast! Well, I ran into a few snags -- needed to change needles a couple of times and it seemed as if the Steam-A-Seam was getting stuck and gumming up my needle (and I tried both topstitch and quilting needles, size 90). Maybe I didn't fuse long enough or maybe I should try a different fusing product (I've since bought a package of Misty Fuse to try for next time). I also did not pre-wash my fabrics, so maybe that was a factor. It wasn't too bad for a first effort. 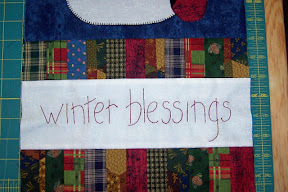 But I decided to stitch the Winter Blessings appliqué pieces using a buttonhole stitch, before quilting anything. I didn't run into any problems with the Steam-A-Seam sticking to the needle this time. I experimented with different sizes of buttonhole stitch on the various areas of appliqué; for the cardinal's body and the snowman's carrot nose and eyes I used a narrow zigzag stitch, just for variety. I have not done a lot of appliqué (other than machine embroidery designs) but I have to admit that I like the buttonhole stitching the best. For both quilt kits, the pattern calls for the words to be hand-stitched using embroidery floss or #8 pearl cotton, but even though I still have tons of floss and pearl cotton in my stash, I wanted to try digitizing the words; besides, if I was going to machine quilt the piece, there was no reason *not* to machine embroider the words, right? 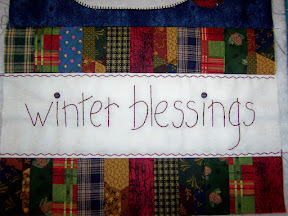 I wasn't quite as successful in the beginning with the Winter Blessings verse - the first attempt with the design wizard left a lot of stitches out of place, most likely because my scanned image wasn't as clean as it should have been. Even cleaning up the stray pixels and using the outline expander in the Design Creator module didn't help much. So I ended up spending time using Stitch Editor to step through all the stitches and moving the stray stitch points back in line where they should have been. I also omitted trying to digitize the dots for the "i"'s; I think I'll use buttons instead. Yes, I know I could have hand stitched both of these faster than the time it took me to digitize and embroider them, but as I've said before, I need the practice with the software. I really like the way it turned out. 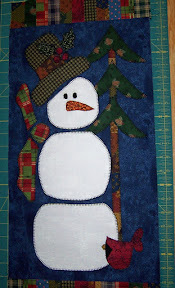 I also stitched in the ditch through all layers at the top and bottom of the snowman section, where it meets the pieced strips, using black cotton quilting thread. I think this will need some other additional quilting, but I'm not sure yet what to do. I need to stitch the snowman's mouth and attach buttons to his chest. If I stitch through all the layers for these, maybe that will be enough? So what's next to do on these two projects? 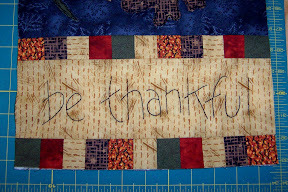 The Be Thankful mini quilt could use the same zigzag stitches framing the verse and then it will be ready for binding, so I will probably attempt that while I'm thinking about what else to do on Winter Blessings. I'll add an update when I have something of progress to share.